Can you set the file name of the uploaded files using data from the record? eg FirstnameSurnamePhoto.jpg? Or even the folder name that the file is saved into? I want to import the images into a database and need consistent filenames so that it can be done automatically. Currently there is no feature or widget available that can dynamically rename an uploaded file/s when using the Upload field on JotForm. But a workaround that you can try is using integration that allows submission upload. Example of these are Dropbox and Google Drive. 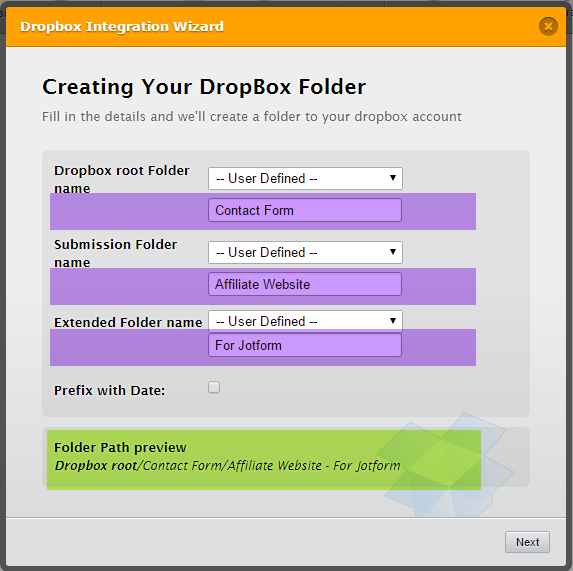 When using this integrations, the Folder Name use by the upload/submissions can be dynamic or changeable. so in the sense the uploaded files can be contained separately on each assigned folder. If you connect the Folder name of Dropbox or Google drive in your back-end application, you will be able to programmatically collect the files on each folder. I will also submit a feature request ticket base on the idea you have here.